Active galaxy: Amazing pic taken by amateur astronomer. 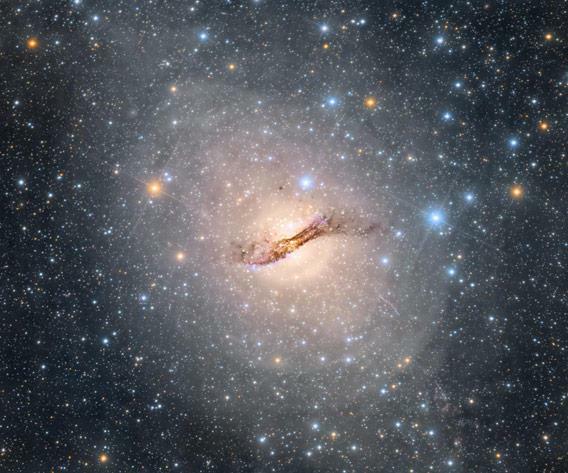 Centaurus A (or Cen A to its friends) is a nearby galaxy with a weird history. It’s an elliptical galaxy—a giant cotton ball collection of stars—that was, until recently, two separate galaxies that collided and merged. It has a huge dust lane cutting right across the middle, a sure-fire sign that the galaxy was the result of a cosmic train wreck. 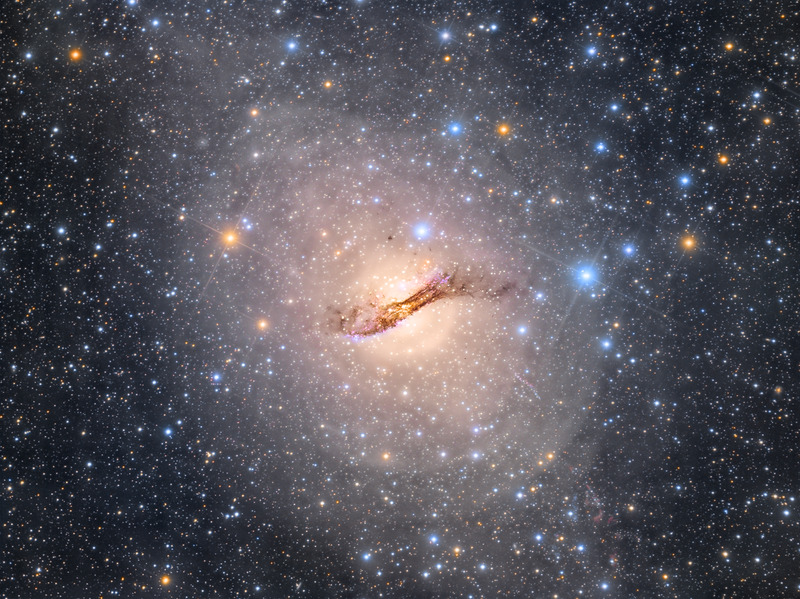 The galaxy Centaurus A, taken by so-called “amateur” astronomer Rolf Olsen. Click to anthrohippenate, and you really want to. 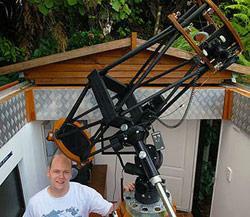 Rolf Olsen’s shot of the Cen A jet (left) versus a professional observatory (right). 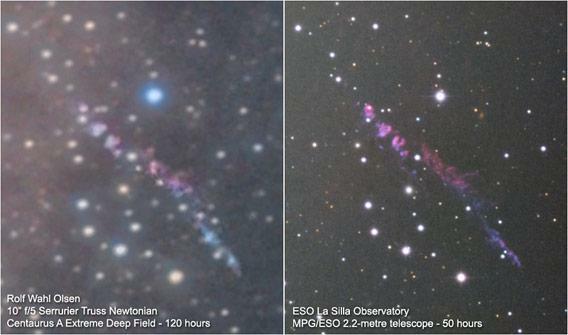 On the left is Olsen’s shot, and on the right one from a 2.2 meter telescope. Obviously, the bigger ‘scope has far higher resolution, and can see fainter stars and features in the jet, but Olsen’s shot is pretty impressive. In the big picture you can also see the shells of gas surrounding the galaxy, which are probably remnants of the collision, which sent out vast waves of material like ripples from a rock dropped in a pond. He was also able to identify over 700 globular clusters in his image—those are tight, spherical clusters of stars that orbit most galaxies. The Milky Way has over 150, but Cen A may have ten times as many. Cen A is pretty close, just 12 million light years away, making it the nearest active galaxy to us, and one of the brightest in the sky. It’s best visible from the southern hemisphere, making it a juicy target for Olsen’s New Zealand location. Still, using a ten-incher to take an image this deep and detailed is a daunting task, so I encourage you to read how he did it. I’ll add that a few years back he contacted me to say he had actually seen the debris disk—the leftover planet-forming material—around the star Beta Pictoris. No amateur had ever done that (it was only discovered in the 1980s! ), so I was very skeptical. But his image and methods checked out; it was an incredible acomplishment. It’s clear he is very skilled and extremely dedicated. To say the least. I can’t even imagine what he’ll try next. But whatever it is, I know it will be worth keeping an eye on his efforts.